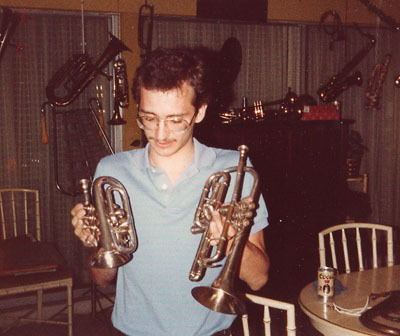 Nick DeCarlis, 1983, in Tampa, Florida, on a visit to an instrument collector’s home. This was the first time I’d seen a pocket cornet, and I thought it was the coolest thing out of the dozens of instruments surrounding me. Note the dazed look on my face. I have no idea what kind it was and cannot tell from this photo. For all I know, it was nothing more than a cheap Indian “Counterfeit” pocket cornet. But the damage was done! 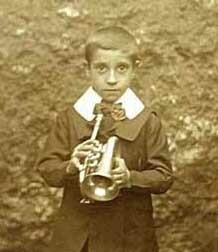 Like a lot of baby boomers, I started playing cornet in elementary school. And while I showed promise, I never enjoyed the regimentation of band and quit after 7th grade. It was later during college, that I started to play again, in conjunction with a developing interest in jazz and big band music. By 1982 I was playing my first gigs, still using the early 60’s Olds Ambassador cornet of my youth. In 1983, my sister discovered that a co-worker at her large accounting firm in Tampa was an avid collector of band instruments, and arranged for me to pay him a visit. I saw many amazing things, but the biggest impression was made by the smallest thing he had – a pocket cornet. It wasn’t for sale, or I’d have left with it. I wanted badly to collect vintage brass at the time, but these were the days before the Internet and Ebay, and you had to visit a lot of antique stores in Florida before you’d find an old horn of any type. It was largely a matter of luck. It wasn’t until 1996 that I went into the local music dealer to pick up some valve oil, and spotted a silver pocket trumpet on a shelf behind the counter. I had no intention of buying anything, but had to play it. Twenty minutes later, I was the thrilled owner of a Jupiter Pocket Trumpet. Later I’d discover that the Jupiter was the introduction to the world of pocket trumpets for many players, as it seemed to be just the right balance of quality (decent) and price (inexpensive enough to be an impulse purchase). Yet nearly all Jupiter owners seem to agree that the design has serious shortcomings, especially with intonation. In addition to collecting, restoring and creating pocket cornets, I also play “standards” and “trad” jazz professionally. On occasion, I even play one of my pockets on gigs! Welcome to this website, which is arguably the largest single source of information on pocket cornets and trumpets available anywhere. Cornets are nearly identical to trumpets*, including the total length of the tubing (were you to unwind it and form into a straight line), so they play in the same key. I have long collected cornets because the variations in how makers “wrapped” the tubing made for endless numbers of interesting designs, unlike trumpets, which are all more or less the same. Pocket Cornets (also called Miniatures, Parlor Models, and Tourist Models) are nothing more than cornets which have had their tubing wrapped in an exceptionally compact design, resulting in an instrument 7 or 8 inches in length, yet playing in the same key and tonal range as their full-sized counterparts. According to period literature, Pocket Cornets were primarily intended for travel purposes, as novelty instruments, or for use by small children. Here is a link to one of the earliest known pockets, actually a pocket cornopean, circa 1850. Nearly all vintage Pocket Cornets utilized removable leadpipe shanks or bits. Most often, the cornet would be delivered with two shanks -- a short one for playing in “Bb,” and a longer one which convert the cornet to “A.” With shank & mouthpiece inserted, the cornet would be longer than the previously indicated 7 or 8 inches -- perhaps as long as 10 or 11 inches with a short “Bb” shank (12 or 13” with the longer “A” shank). These vintage instruments were often made to play in so-called “high pitch” (HP): +/- A=452Hz. Later instruments are “low pitch” (LP): A=440Hz. Some cornets came with a second tuning slide to make this conversion. I have fabricated LP slides for several of my instruments. While I cannot absolutely determine the point at which removable shanks were rendered obsolete, the AMATI and Alexander pocket cornets of the 1960’s were surely among the last to have this feature (I do not indclude the “decorative” copies being made in India). Only recently have I been able to document one of the earliest pocket trumpets, a Calicchio, as having been made in the late 1940’s.